Back in the day, when you thought of sushi, what came to mind was a healthy slice of raw fish with some rice rolled up in nutritious seaweed paper. 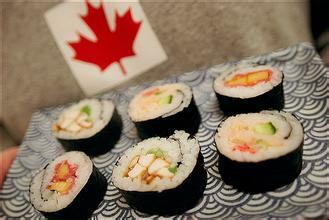 However, with the popularity sushi has gained over the years, many ingredients have been added to it. This includes fried fats, fatty mayonnaise and white rice laced with sugar. Well, it tastes better than initial version did, but it is way unhealthier. However, you can still enjoy sushi and be healthy. Read on and get tips on how to pick the healthiest sushi rolls. When you walk into a Japanese restaurant, you might be a bit confused due to the many Japanese cookery terms. However, here are tips that will help you to identify the healthiest sushi rolls on the menu. Avoid tempura rolls: Tempura simply means fried. In addition, once wrapped in a roll, the crispy texture tends to be mushy. Skip the rice: If you can get a roll that does not have rice, but instead, has soy bean or cucumber, opt for it. You can also ask the waiters if they have rice free rolls. Take less avocado: True, avocado fat is healthy, but you eventually build up calories in your body if you take it frequently. Plus, the avocado taste is no longer there when you add other ingredients. Take more veggies: If you like flavor and the crunchy feeling, then ask for more cucumber, scallions and carrots in your roll. Take maximum of 2 rolls: A roll has about 8-10 bites, but it is loaded with about 400 unhealthy calories. Instead of taking several rolls, get a fancy roll coupled with a basic one, some soup or salad and you will keep it healthier and enjoy more delicious items. Ask for temaki: Also called hand rolls, they are cones of seaweed with a little rice and other ingredients that a traditional roll should have. This has 80 calories less than the usual rolls. Insist on brown rice: The taste will not change much, but you will have more fiber in this version. Do not deviate from the basics: Sure, a fancy roll is tastier because of the added ingredients like tempura coating and cream cheese, but they are equally unhealthy. Stick to fish, veggies and rice. Choose the sashimi platter: Raw fish is good, but a normal platter has 3 servings. You can either share it with a friend or you can pick the appetizer-sized sashimi platter. Pick wasabi spice: Other spicy sauces have mayonnaise. Instead, choose wasabi as it has less calories. Limit the soy sauce: Select low sodium soy sauce and use only a tablespoon. It will give you the body’s daily requirement for sodium.Do you have high levels of sodium? This is probably because you are taking miso soup that has low calories but is quite salty. Brown sauces can contain high amounts of sodium as well. Go slow on the soy sauce: Sushi is already seasoned when served, so adding extra salts might tamper with the taste of the fish. If you feel you need to add more salt, do not fill the sauce cup. Instead, after every bite pour one or two drops of soy sauce on the roll. You can also make healthiest sushi at home. This way, you will be sure what ingredients are in your roll. Here is a recipe you can try out. When finished, with ½ cup serving, you will get only 94 calories, 1 gram of fat, 0mg cholesterol, 0g added sugars, 18g carbohydrates, 3g protein, 3mg sodium, 109mg potassium and 2g fiber. It is surely one of the healthiest sushi rolls because of using brown rice instead of the customary white rice. Combine all the ingredients in a saucepan. After adding water, let them stand for 30 minutes at room temperature for 4 hours so that the grains are fully soaked. Cover the saucepan with a tight lid and bring the content to a boil. Let it simmer under low heat till all the water has evaporated. This might take 30-40 minutes. Turn off the heat and let it stand for 30 minutes when covered, then uncover for 1 hour to let it cool. Sushi is yummy when accompanied by a sauce. You can try out the dipping sauce below. It is low in calories and completes the healthy sushi you have just prepared. For the sauce, you will need ½ cup and 2 tablespoons of low sodium soy sauce, 2 tablespoons lemon juice, 2 tablespoons lime juice and 2 tablespoons of white vinegar. Combine all the ingredients in a bowl, then refrigerate for a maximum of 2 weeks. This sauce will only give you 6 calories, which is not bad at all for a sauce, and zero fats and cholesterol. Food borne diseases: Eating raw fish can make you vulnerable to viruses, bacteria and parasites. An example is roundworms that can eat through your stomach and cause serious pain whichis usually confused with appendicitis. The fish should be frozen completely in order to kill parasites. Increased levels of mercury: If eating too much sushi, it is tend to increase the level of mercury in your body. Fish, both raw and cooked, is known to have a relatively large amount of mercury. Examples of fish with the high amounts of mercury include king mackerel, Ahi tuna, Bigeye, swordfish and marlin. You can pick out salmon, crab, scallop and shrimp, which have low mercury or those that have moderate mercury like lobster, halibut and skipjack tuna.